The News and RSS extension module is a module that provides a full blown news publishing service using the content management system in our software. Search engine placement can be determined by the freshness of your content. With the NewsRSS module, your content can always be fresh. News articles can be published to an article list, skin widget and/or RSS feed. 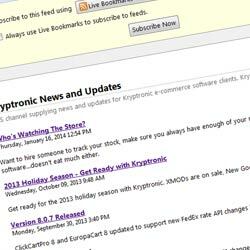 Use as a news service, a way to broadcast store product updates, or both.